The Green Chromis is by far one of the most popular saltwater fish amongst fish keeping hobbyists. Its dazzling color and flamboyant personality are all reasons why it has remained so popular for over 30 years. Whilst many members of the damselfish family are known for their aggression, this particular family member is known for its calm and playful nature. If you are short on time you can read our quick facts table below for a brief overview. The Green Chromis, also known as Blue Green Chromis (and scientifically as Chromis viridis), is a hugely popular saltwater fish. In the wild, they will be found in the Indo-Pacific region and spend large amounts of their time in protected areas such as lagoons and corals. You will typically find them in large shoals as they are peaceful fish. They will grow up to 4” long and are known for their vibrant shades of green. They have a slender oval shaped body with a distinctive forked tail. A shoal of these swimming through your aquarium will provide flashes of green as the lighting hits their body. Its popularity is due to its peaceful manner, beautiful appearance and relative ease to care for (regardless of the keepers’ experience). In addition to this, it can also make a great community fish and is reef compatible (more on this later). If you are planning to keep a group of them you must make sure you keep at least 6; this helps to prevent occasional bullying. As Green Chromis are social fish it is not recommend that you keep them on their own. In an aquarium you will find that they are one of the most active swimmers spending the majority of their time in the middle water column. Overall, because of their affordability, stunning coloration and ease to keep, they are a great addition to any aquarium. Renowned for their beauty, Green Chromis can vary in color from light blue through to pale green. They have a compact body with a glorious forked tail giving it a striking appearance. This is with the exception of matured males, who, during mating, turn into a yellow color with a black tail. You should expect a Green Chromis raised in an aquarium to grow up to 3” with wild ones growing up to 4”. As a result of this you can keep them in smaller aquariums (more on this later). Then Green Chromis is commonly confused with a Black Axil Chromis (Chromis atripectoralis). The Black Axil has a slightly longer and slender body. It also has a black blotch on its inner pectoral fin; hence the name. The Green Chromis is a saltwater fish found in the shallow reefs of the South Pacific and Indo-Pacific Ocean. You will find them in large shoals spending the majority of their time in coral reefs and lagoons. 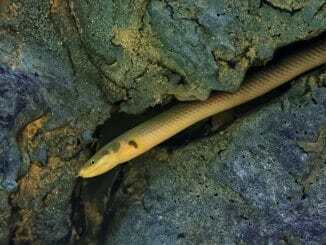 They swim in shallow waters of around 1 meter but have been found at depths of up to 12 meters. Like always, we recommend that the aquarium you place your Green Chromis in, matches their natural habitat as closely as possible. 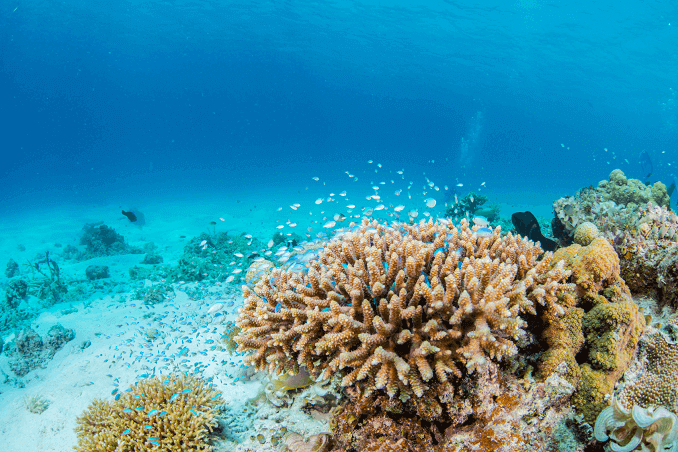 As they spend a large amount of their time in coral formations, you should make sure that their aquarium is full of coral; they love to live, play and hide in it. If you’re starting out try corals like Acropora. You will notice that in an aquarium the Blue Green Chromis will swim in all levels of the water column, but you will mainly find them in the middle; they are active swimmers and will be one of the ‘busier’ fish in your aquarium. If you’re keeping a couple of them; a smaller aquarium of 30 gallons will work fine. However, if you are going to keep a shoal; then a minimum of 60 gallons is needed. The water temperature should be between 72.0 to 82.0°F, with a pH range of 8.1-8.4 and a specific gravity of 1.023 to 1.025. As previously mentioned, you should have plenty of coral within the tank and ideally some planted sections with algae for them to graze on. 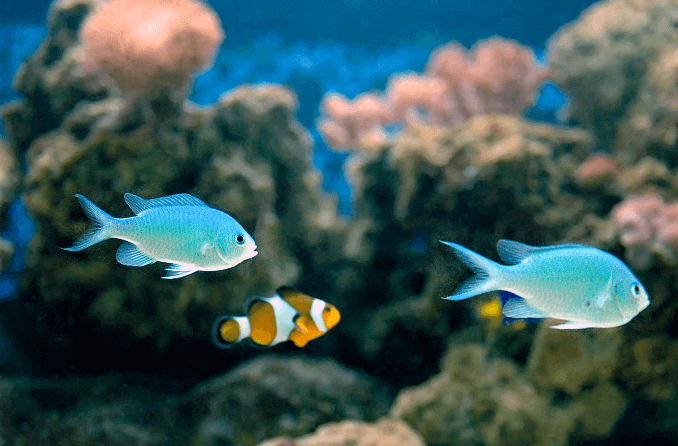 Unlike many freshwater fish, water movement isn’t particularly important for saltwater fish. However, if anything, you should ensure that the current isn’t too fast. As mentioned in the breed overview section, these damselfish fish as very hardy and recommend to beginners for this reason. With this being said you still need to take care with water changes and poor water quality; this can result in diseases. If you have a smaller tank (30 gallon) you should perform 15% water changes fortnightly. If you have a larger tank (60 gallon+) for a shoal then then you can perform a 30% cycle monthly. This type of Damselfish is an omnivore, meaning it will eat both animal and plant matter. 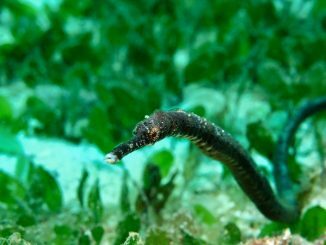 In the wild they are somewhat of a scavenger; eating larva, mysid shrimp, copepods, zooplankton, phytoplankton and algae. They have even been known to eat fish eggs that haven’t yet hatched. As they each such a wide variety of foods, you must ensure you offer them a varied diet in your tank. Fortunately Chromis are fantastic eaters and will eat just about anything you give them, including: frozen food, flakes, pellets, meat and vegetables. For frozen food you can feed them Krill and Mysis shrimp. You can also use a liquid vitamin which will help their body color stay vibrant. You can supplement this with an herbivore flake and fresh finely cut vegetables. 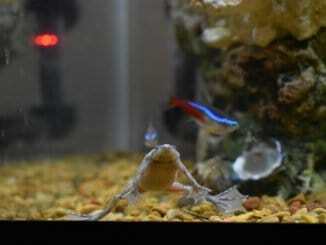 In terms of how often to feed them, it depends on the size of your aquarium. Ideally you should feed them 3 times a day. If you have a smaller tank I would recommend feeding them once a day. Feeding them too often in a small aquarium is a common beginner’s mistake, and will result in poor water quality as rotting food alters the pH levels. Whereas, if you have a larger aquarium (60+ gallons), you can stick to the ideal 3 times per day feeding routine. 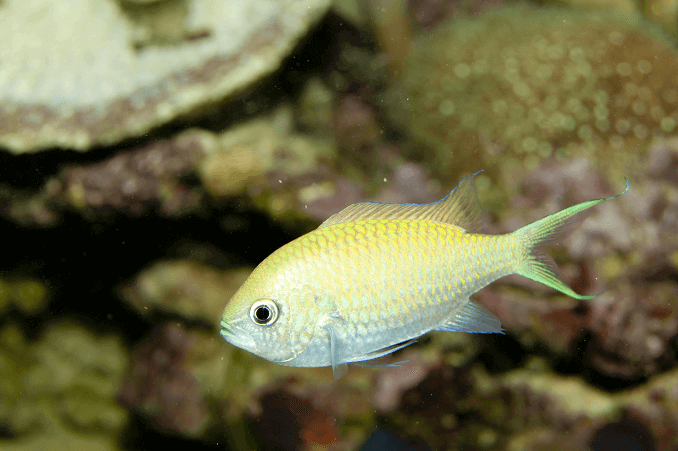 The Green Chromis is a very active fish and loves to swim. It’s even more mesmerizing to watch in a shoal as they swim throughout the aquarium’s corals in synchronization. 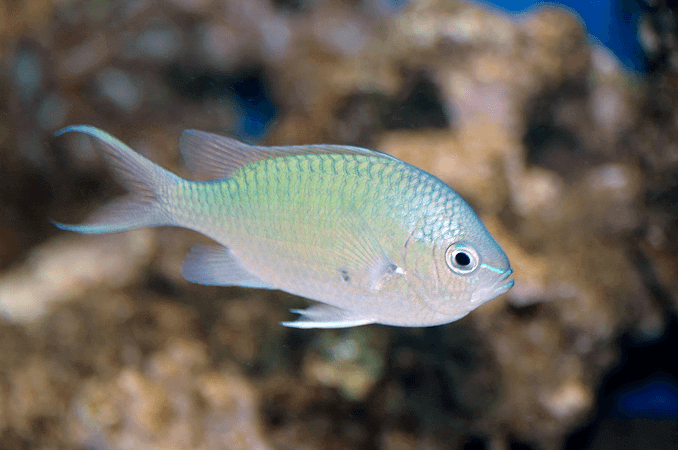 Whilst the majority of damsels are known for their aggression, the Green Chromis is the exception. They are known for their reasonably peaceful temperament and can be kept with lots of other community fish. If you are planning to keep them in a school make sure to keep at least 6 (more on this later). If you observe them closely, the majority of the time you will see them swimming in the middle sections of the water column. They are fast swimmers who will play with each other if kept in a community tank. They will swim amongst the coral and will generally ‘sleep’ within the coral so make sure to have plenty around. The only exception to this is that you will notice when spawning they can turn aggressive to one another, so if you’re intending to breed them be careful. The Green Chromis can make a great community fish; they can even create a school with their own species (more on this later). As mentioned above, they are reef compatible and you can keep them with corals. You will want to keep them with other friendly community fish such as: Basslets, Butterflies and Blennies. If your Green Chromis is being bullied it will spend nearly all its time right in the top corner of the tank. This is when you need to take action; either remove it or the bully. One of the most impressive things you can see in a home aquarium is a school of Green Chromis. You will see vibrant flashes of greens and blue as they swim in the mid-upper water column. To have a healthy school of Green Chromis you need to have at least six. When you first add them to the tank you will notice they form a hierarchy very quickly; like a pecking order for chickens. The most dominant Green Chromis will be at the top of the hierarchy with the weakest, most submissive, at the bottom. You need to keep at least six together to prevent the ‘alpha’ from bullying each individual fish too much; it helps spread out the aggression. Unlike many members of the damselfish family the Green Chromis is a peaceful fish that would make a great addition to a community tank. This will be one of the busier fishes in your tank and you should make sure to feed it a varied diet. You can also keep them in a school which produces a spectacular variety of greens. You should make sure that their aquarium has plenty of coral as they love to swim and sleep near it. Overall, it is a resilient fish that is easy to care for and would make the ideal starter fish for a beginner. Can you keep the blue/green chromis together with the Weber’s chromis? I would ideally like to put 3 of each in my tank, but don’t know if I should or not. Also, should I put them in all together?